Experimental approach and characterization of influenza-induced plasmablast populations. (A) Experimental outline. (B) Sorting strategy. 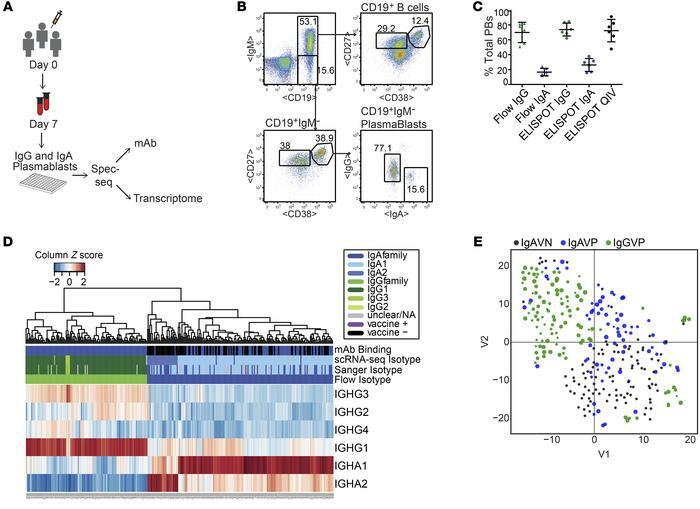 IgM– plasmablasts were identified as CD19+CD27++CD38++ and either IgG+ or IgA+. (C) Frequency of total plasmablasts of each isotype as detected during cell sorting and through anti-Ig ELISPOT. The ELISPOT data also report the frequency of vaccine-specific plasmablasts (QIV). Line indicates frequency mean. (D) Heatmap of all 291 single cells, clustered by their relative expression of the 4 IgG subtype genes and the 2 IgA subtype genes. Annotation bars across the top show the mAb vaccine binding and 3 levels of BCR isotype validation. (E) tSNE projection of the entire transcriptome of all 291 cells colored by group ID and with monoclonal antibody vaccine binding area under the curve (AUC) indicated by spot size.